We’re super excited to share the deets of this year’s medal haul from the 2019 San Francisco Chronicle Wine Competition. We’re always proud to be recognized for our hard work in the cellar—but this year we’re feeling particularly proud of a Double Gold for the 2016 Grenache! This wine has been a fave for many of you for the last several years—and we’re so grateful that the judges agree with our customers! 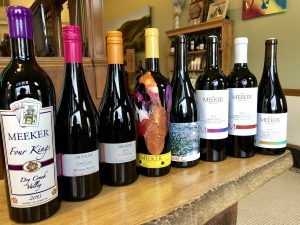 Interested in trying or buying any of these wines? Give us a call (707-431-2148) or email (tastingroom@meekerwine.com) at the tasting room and we’ll get you set up. As most of you know, my business desk has been located in our winery’s Geyserville tasting room since 2014. 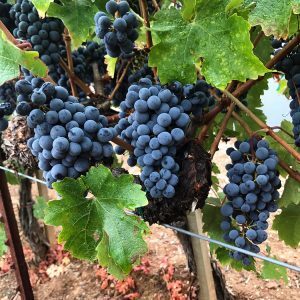 The Sonoma County grape harvest generally begins in late August and continues into early November, with activity peaking during late September and early October. I particularly enjoy these peak harvesting periods as experienced by looking out our tasting room’s front window onto Geyserville Avenue— and also by listening. But what I see and hear from my desk is quite different than what most people might imagine when contemplating the joys of grape harvest! While Geyserville is surrounded by vineyards, there are no vineyards visible from our tasting room. Just buildings along Geyserville Avenue and the junction with Highway 128. So what do we see and hear during peak harvest periods? Lots and lots of flatbed trucks, or more often trucks with their own flatbed plus hauling a second flatbed as a trailer, all carrying aluminum grape harvest bins, each bin capable of carrying up to two tons of grapes. Most of these bins are empty in the morning hours, so in addition to seeing these bin-carrying trucks drive by, we hear loud BOOMS coming from the bins as, within their tie-downs, they bounce on the flatbeds. BOOM!, BOOM!, BOOM! But this changes in the afternoon, when most of the bins are full of grapes. The booms are gone, but are replaced by very loud engine sounds as each truck struggles to haul the massive weight of as many as twelve aluminum bins filled with grapes. Also, interspersed among these flatbed trucks, there are tractors driving by, as well as large automated grape picking machines. Ahhh, these harvest sights and sounds are music to my ears! In closing, I would like to share with my Tribe friends my sadness regarding the recent passing of my friend Burt Reynolds. I served as Burt’s motion picture industry attorney for many years when I was practicing law in Los Angeles during the 1970’s and early 1980’s. Burt was not only a great actor; he was also a very fine person! One of my favorite memories of Burt occurred on a spring afternoon when Burt was shooting a motion picture on the Paramount Pictures lot. I had just picked up my ten-year-old daughter Michelle from her grade school. But I also needed to get Burt to sign several copies of the completed contract for his next motion picture, so rather than taking Michelle directly home, I drove with her to the motor home on the Paramount lot that the motion picture company was supplying to Burt for his personal use while the film was being shot. I left Michelle in my car, and walked up to the motor home door and knocked. Burt answered and I entered for a short meeting with Burt to summarize the completed contract. He then signed the contract copies, and I shook hands with him and walked to the trailer door. He followed me to the door, and as I walked down the steps outside the door, Burt asked: Who is that person in your car?” I replied that she was my daughter whom I had just picked up from school. Without saying another word, Burt followed me down the steps, walked to the car and opened the front passenger side door. He first put out his hand and shook Michelle’s hand. Then he leaned inside the car and kissed Michelle on the cheek. We and he waved at each other as we drove away. Michelle had a huge smile on her face for a very long time. Harvest is always an exciting, emotional, tense, and rewarding time of year for our family. 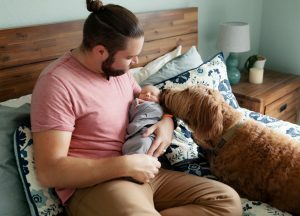 This year it is even more so: my wife, Erika, and I welcomed our son to the world on July 31st, just 18 days before we received our first fruit of the year. His name is Canyon Rutherford Meeker (he shares a middle name and initials with my dad), and he was 8 lbs 15 oz and 21”. I’ll spare you the details, but Erika was in labor for 62 hours before delivering via Cesarean section. We’re all happy, healthy, and…tired. So you can understand why I’ll keep this newsletter short. Please enjoy these pictures of the newest Meeker, and I’ll share a full update on this year’s harvest in our next installment. A quick preview: yields are up, but so is hangtime (rule of thumb: more time on vine = better grapes). 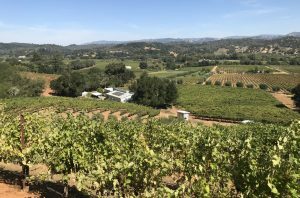 Quality seems to range from slightly above average to excellent, and the quality on Merlot and Zinfandel seems particularly high. The Dry Creek Valley Merlot we received had some of the darkest color at the juice stage I’ve ever seen—of any variety! We’re anticipating a very busy first week of October, with approximately a quarter of our total tonnage for the year to be picked and processed in a few days. Luckily, our harvest crew this year has a very positive attitude. Ricardo, our Cellar Master, is in his 18th harvest season with us. 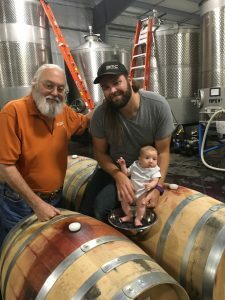 He’s joined by Kat, who spent harvest 2013 and 2017 with us and stayed on as Cellar Assistant; Stephanie, a Chilean who has multiple harvests under her belt at bigger wineries on both sides of the equator; and Matt, who is the son of wine club members and is pursuing a Wine Business MBA at Sonoma State. They’ve been an excellent team so far, especially through a few very long days, and the wines are already reflecting the consistency and care of their work. I’m very fond of the two wines we’re sending you in this shipment. The Handprint needs no introduction, but I do think this is one of the better vintages of the past decade. The second wine, our first release in about 20 years of a wine from the Scharf Family Vineyard, is very special to our family and the history of our winery. The Scharfs are friends of our family since the ‘70s, and Kelly and I grew up with their daughters. 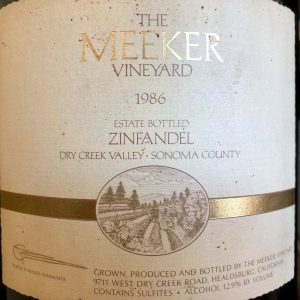 Their vineyard produced the first vintages of Four Kings in the ‘90s, including the venerable 1995 vintage, which was one of the best wines we’ve ever made. The 2015 vintage was the first time I got to work with the fruit, and it was a pretty special experience for me. Block 1 of the vineyard is older than I am, and I have fond memories of running around and playing among those vines as a young kid. The fruit and wine from this vineyard is special in quality and character, but incredibly special to our family in tradition and sentiment. I hope this newsletter and these wines find you happy, healthy, and enjoying the beginning of autumn. As always, when you’re in town our door is open to you, and I’m always available by email at lucas@meekerwine.com. Temperatures are rising, bunches are forming on the vine, and we’re getting organized for harvest! Before the long hours and crazy days set in, we want to invite you to join us here at the winery for our upcoming Summer Cellar-bration. We will be serving some great wines from our cellar paired with seasonal hors d’oeuvres and great company. We’d love to see you here! All Tribe members are invited, and you’re welcome to bring two guests (no charge). Non-Tribe members are welcome too; your cost to attend: $20/person. Learn more about our winemaking philosophy, and winery story in the Wine For Normal People podcast. 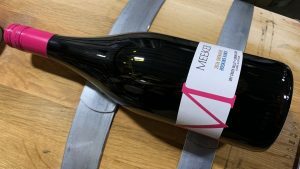 Head winemaker Lucas Meeker shared his thoughts in their latest episode. Don’t miss it! February Tribe Newsletter: Tasting Notes and More! Hi there, Tribe members! Your Tribe shipments are on their way, and we know you’re looking for the Meeker February Tribe Newsletter. Click the link to read tasting notes, Lucas’s stories about how these wines were made, and much more.